April 09, 2013 in "Rowan", "baby knits"
Here's our boy, all geared up for his first stroller walk. We just made a short trip around the block, but it was fun! Chris and I spent a lot of time walking around our neighbourhood waiting for Rowan to decide that it was time to join us. Having him here now to walk with us is certainly a treat. 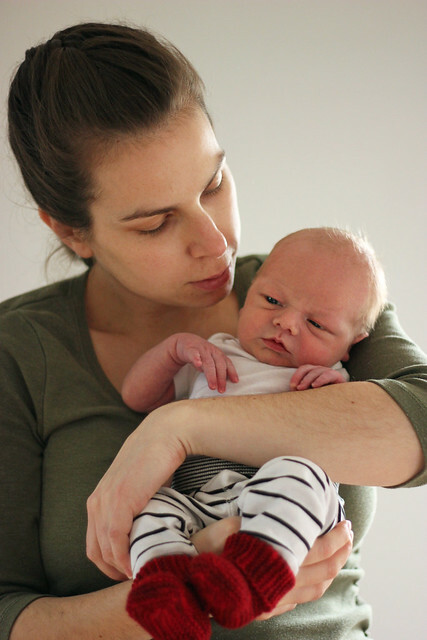 We've tried a few newborn hats in the past 5 days, and the best one by far is this Easy Peasy Newborn Sock hat. This hat is awesome. 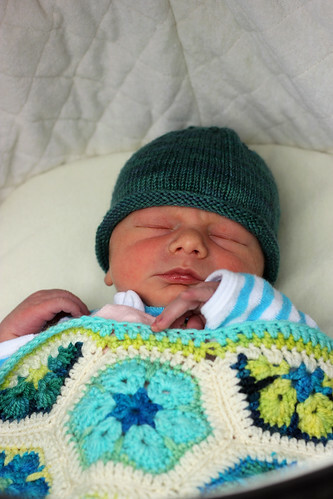 I knit this hat to go with my Moss Sunnyside Baby Cardigan and he wore it when we came home from the hospital. It really stays on, has tons of stretch and is really cute. Knit up in Purple Label Cashmere it can't be beat! Yarn: TFA leftovers in Blue Label and Purple Label, plus a bit of BMFA (the multi's). This isn't the first time I've hopped on the bootie train. There is just something about these adorable little socks (or are they baby shoes?) that get me hooked. Once I start I just can't stop. I knit the purple pair because I wanted something to match the “in case we have a girl” outfit. They were so cute I decided to knit the red pair (in cashmere!) because babies need cashmere too and because I have the perfect pair of black and white striped pants that need bright red booties to go with them. Then the multicoloured pair, because multi’s are fun. Then the seabreeze pair with the sand soles because most of my baby wardrobe is those shades and now we’re ready for any occasion! Huzzah! 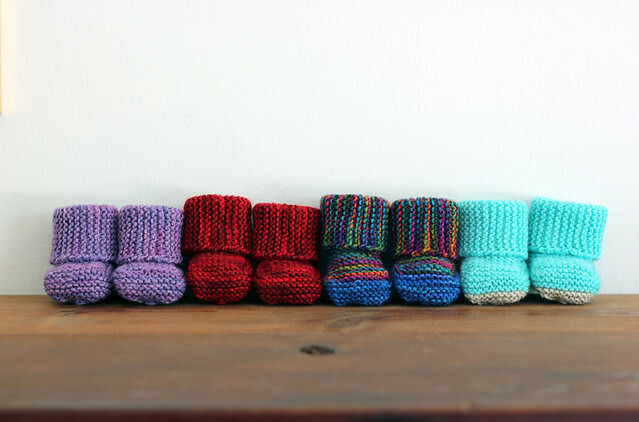 You saw Rowan sporting his Seabreeze booties in his first picture on Sunday, they look adorable and are pretty great. Full disclosure... they don't stay on bare legs as well as I had hoped they would. However, with pants they stay on much better. That super soft baby skin is just too slick for the booties to really stay on well. He'll be wearing them regardless, I have all the patience in the world when it comes to those adorable little feet.